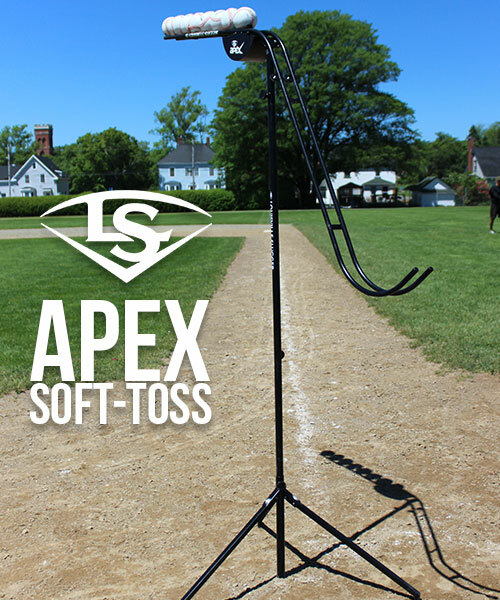 The Louisville Slugger APEX Soft-Toss Machine /Tee Training System is designed to bring every player, coach and team to the top of their game. Forget about heavy and cumbersome equipment, the Louisville Slugger Apex Baseball Soft-Toss Machine / Tee Training System has you covered. The Apex throws perfect soft-toss with real baseballs, softballs, tennis balls and training balls. This collapsible and compact soft-toss system allows you to take your training anywhere and train with or without a partner. Load the feeding arm with baseballs or softballs and set the release timer at 6/8/10 second intervals allowing you to get your swings without the need for a soft-toss partner to throw the balls. Your coach can now focus on improving your swing and not tossing the balls. The slope arm tosses the ball perfectly every time towards the batter at pitch level for more realistic, game-like training. No more soft-toss from the side, popping up from below, or dropping from the top. This promotes the load-phase aspect to soft-toss leading to consistent and successful approaches at the plate. Its telescoping arm adjusts for batters of any height from beginners all the way to the pros.